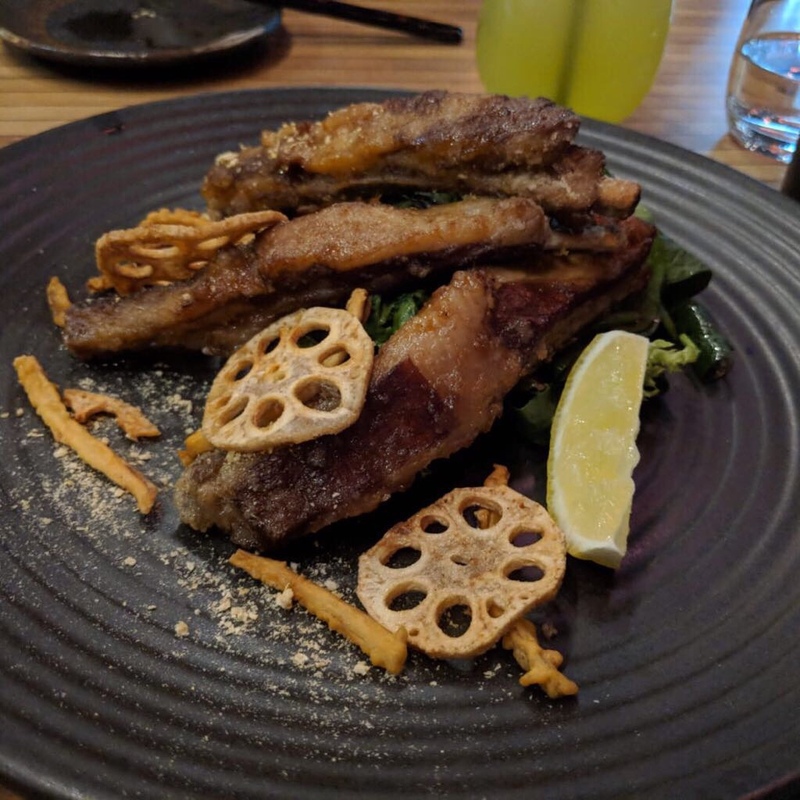 A Japanese izakaya restaurant – the only one in South Wharf. Which probably has its distinct reason why it is rated high amongst the other restaurants by the pier. This place gets busy from 7pm. I noticed many reserved seating are for late dine-in, lots of sake and alcohol were ordered with karage (fried chicken). Their food menu is simple, but beverage menu was a bit everywhere. There was a small selection of non alcoholic drinks so we started with a Ramune – Japanese soda lemonade drink and a cold green tea. The soda lemonade are those bottles with a marble inside. Had I known that was the drink I probably wouldn’t have ordered it. Later, I found out they had better selection of beverage menu on the other side of their menu! They had mocktails like yuzu green tea and virgin lemon soda. I wish I knew before hand… Cold green tea is bitter – careful for those who like their sweet drinks! The restaurant was clean and had an alfresco that overlooks the south wharf with the view. Thee outdoor dining area was enclosed and heated. For a couple that seldomly dines outdoors it was very pleasant. Staff were very friendly and felt like authentic japanese. We started with agadashi tofu, presentation was good but it was underwhelming. For an entree I see why there’s 1, would have liked a couple more tofu for the price of $16. The wild mountain veggie sauce accompanied the tofu well. We cleaned up the sauce. Another fatty dish good for sake and beer. We had this with half a bowl of rice each. It was good, but no stand out for the dish. there’s not crawling skin – it was just cooked pork belly. We didn’t want to end our dish with dessert even though the dessert of the day sounded amazing – Black Sesame panna cotta. We decided to order a hot matcha latte each. The matcha was the real deal and tended towards to bitter end which we liked. A little milkier than we like.